We also played a game about opposites using words that indicate position (high, low, in front, behind, over, under). 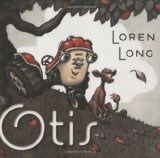 Otis is the story of a small tractor who loves life on the farm. When a calf arrives in the stall next to Otis, he befriends the young cow. It is not long before they discover ways to play together in and around Mud Pond. All is well until a shiny new tractor arrives to work on the farm. Sadly, Otis is parked behind the barn and the new, larger tractor goes to work. When the little calf gets stuck in Mud Pond, the farmer frantically looks for some way to rescue her. Thankfully, Otis responds when everything else fails and, with hard work and determination, Otis rescues his friend. Fans of Mike Mulligan and His Steam Shovel will thoroughly enjoy this gentle story about friendship. 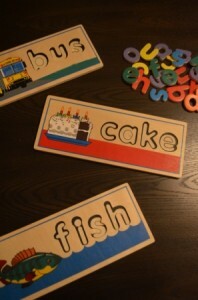 In this week’s Beginning to Read class we played an alphabet recognition game, I call Boom. It is a fun way to review letter names quickly. We also spent quite a lot of time, talking about rhyming. Learning about rhyming and recognizing rhyming words enhances your child’s phonemic awareness. We played, making silly rhymes with our names and talking about rhyming words. Our word family today was the “-all” family. We began with the /all/ sound and added different sounds to it, in order to make words. We made ball, call, fall, hall, mall, tall, wall. Once we had finished playing with sounds, we used letters (b, c, f, h, m, t, w) to change “all” into ball, call, fall, etc. Our story today was Lois’ Ehlert’s beautiful tribute to fall leaves, Leaf Man. This is a wonderful story to share at this time of year. The beautiful die cut illustrations are a wonderful inspiration for young artists. In Getting Ready to Read this week, we talked about letter “G”. As adults, we know that “G” can make two different sounds. The sound we hear in garden, gate, go, green, gloves, glue is referred to as the hard “G” sound. This is the “G” sound we talked about in class. 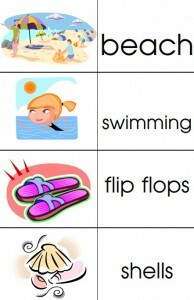 As the children move ahead with reading, they will learn that “G” also makes the sound we hear in gym, giraffe, gem, giant. This sound is referred to as the soft “G” sound. We are not going to confuse the children by introducing the soft “G” sound at this stage. 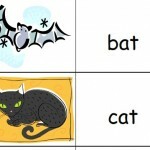 When they are ready to learn about the soft “G” sound, you will want to know that “G” usually makes the hard sound when it is followed by “A” (gate), “O” (go), “U” (gum) or a consonant (great). It usually makes the soft “G” sound when followed by “E” (gem), “I” (giant) or “Y” (gym). Our story this week was Honk! – The Story of a Prima Swanerina written by Pamela Duncan Edwards and illustrated by Henry Cole. Our theme was Bathtime and we played a fishing game – fishing for rubber ducks (each had one of our word family words on it). 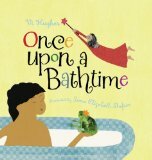 Our story was Once Upon a Bathtime by Vi Hughes and illustrated by Sima Elizabeth Shefrin. Add actions to these fun chants for bathtime. A free printable for home and preschool. I love using word families with beginning readers. If you wish, you can download and print off more word family materials for your child here. I am delighted to have your children in my programs. In Getting Ready to Read (Tuesday at 4 p.m.), we began by talking about letter F, our theme was Down on the Farm. If your child would like to do some homework for our next session, please have him/her bring pictures of things that begin with letter F. He/she can draw the pictures or cut them out of an old magazine. Please note, if your child enjoyed this story, Doreen Cronin and Betsy Lewin have teamed up for more wonderful books about Farmer Brown and his animals. Look for Click, Clack, Moo Cows That Type and other great books at the library. Beginning to Read (Thursday at 4 p.m.), we began by talking about vowels (A,E,I,O,U,Y) and the ug word family, our theme was Down on the Farm. Learning about rhyming is an important prereading skill. You may be interested to visit my page about phonemic awareness. 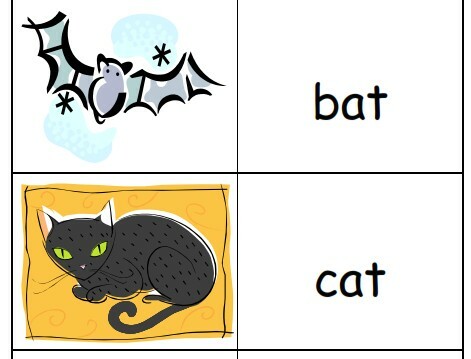 If your child is interested to do homework over the course of the program, I would love to have him/her draw or find pictures of rhyming words. Olivia has her own website, with lots of fun activities for youngsters. Beginning to Read Day 5 included a delightful, rhyming picture book How Do Dinosaurs Go to School? written by Jane Yolen and illustrated by Mark Teague. The children enjoyed lots of laughs as they watched dinosaurs join a carpool, race through a school hallway, have fun at recess and try to behave properly in a classroom. This is a great book to read at this time of year. It provides gentle reminders about appropriate (and inappropriate) classroom behavior. Children love to watch enormous dinosaurs struggle to manage their manners – just as some children struggle in a classroom/school setting. Day 5 also introduced the “Ot” word family – cot, dot, got, hot, lot, not, pot, rot plus three “tricky words” spot, slot and knot. Our Bingo game today reviewed all of the word families we’ve looked at this week. In today’s Beginning to Read class, we spent some time exploring rhyming. Some of the children have a good concept of rhyming while others are just beginning to understand. 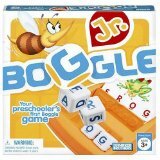 We began with eight pictures (king, ring, tree, bee, house, mouse, etc.). The children looked at the pictures and matched the rhymes. We later played an active game and they listened in order to determine whether two words rhymed. Hearing rhyming and developing phonemic awareness is a key to reading success. 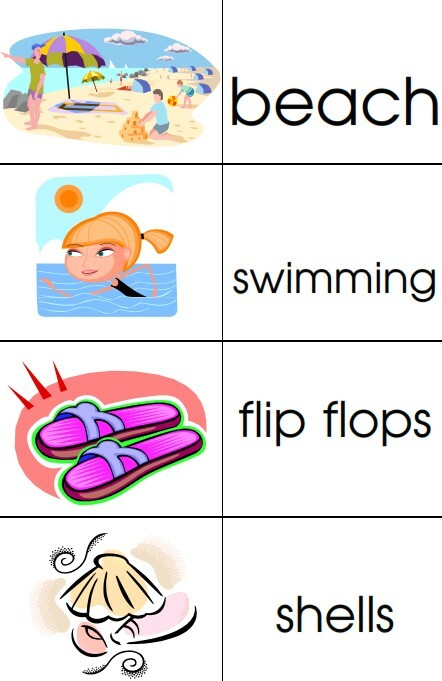 If you would like to print some pictures of rhyming words, follow this link to Storytime Standouts’ free printable rhyming words. For additional information about rhyming and phonemic awareness, click here to check out our Phonemic Awareness page. We also played a fun game that served as a review of this week’s word families. The children were given three or four cards, each a different color (red, green, etc.). Then, each of the children with a red card stood at the front of the group. The children held the cards up and we ‘read’ the words. Occasionally the children positioned themselves correctly and the three letters formed a word. More often, the children had to rearrange themselves in order to spell a word. 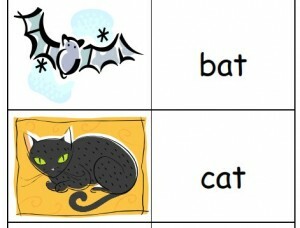 In some cases, the letters could be used to spell more than one word (tip,pit / rat,art). The children had lots of laughs with this activity because they ‘read’ silly words before finding the correct word. “TPA” became “PTA” and perhaps “APT” before “PAT” was revealed. This activity was a review of each of the word families we studied this week. If you would like to print out some word family resources, follow this link to Storytime Standouts’ free word family printables . Today’s story was The Gaggle Sisters’ River Tour written and illustrated by Chris Jackson. This was a challenging story for some of the children because it includes some relatively difficult vocabulary (hauled, sobbed) and there is a considerable amount of text. I am happy to say that all three groups remained engaged and interested throughout the story. 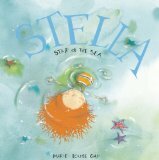 In our first Beginning to Read class for this week, our theme was ‘the beach.’ We read a story by Marie-Louise Gay titled, Stella Star of the Sea. We talked about Stella and her little brother, Sam. We noticed that Sam is afraid and that Stella is not. We also talked about the fact that Sam asks many, many questions. Sometimes Stella’s answers are correct and sometimes her answers are not. Most of the children were able to make connections between this story and experiences they have had. Many talked about going to the beach and seeing shells or sea stars, some talked about being on boats and seeing killer whales. I think Sam’s hesitance to dive into the water is something we can all relate to. You might be interested to hear some of the children’s responses to my question, “Why might it be noisy at the beach?” I thought they would answer, “The sound of the waves is loud.” Actually, they mentioned that crabs make quite a bit of noise, sperm whales are also loud. Others mentioned sea gulls. With some prompting, some of the children thought that the waves (caused by boats) are loud. By the way, we love it when children make connections with the books they read! Whenever possible, try to match books to your child’s experiences; starting school, travelling, going to the dentist, planting a garden, visiting a fire hall. Also, just a gentle reminder, reading aloud to children continues to be important – even when they begin reading independently. When your child begins to read, make sure that you continue to read books that s/he is not yet able to manage. You will motivate your child to become a better reader! In today’s class we talked about vowels (A, E, I, O, U, Y). The children learned a little song about vowels. We will use one vowel each day and today’s vowel was “a.” We combined “a” with “t” to make the work “at.” Once we had read “at,” we added b, c, f, h, m, p, r, and s to make words. We also tried some “tough” words: flat, that and splat. Also, just a quick note to say that none of our classes are full this week. There are places available at 12:30, 2:15 and 4:00. If you have a friend who is interested, please have them call the Registration Call Centre or stop by Steveston to register. It would be my pleasure to see the last few spaces filled.